The Colorado Cocker Spaniel Rescue is a non profit organisation that rescues and finds homes for English Cocker Spaniels, American Cocker Spaniels, and Cockerpoos in Colorado, USA. Having rescued the dogs Colorado Cocker Spaniel Rescue then provides medical treatment and tender loving care until they are healthy enough to find a new home. Colorado Cocker Spaniel Rescue find homes for unwanted and abandoned Cocker Spaniels from stray dog pounds, and homes that can no longer look after them. The dogs stay in foster homes looked after by our volunteers in the area around Denver, Colorado until they find a suitable home. Our organization is made up of a few caring volunteers who provide loving care; in the form of food, shelter and transportation for the animals, while we search for new homes for them. We address any medical needs they may have, get them cleaned up, groomed and generally feeling better and provide them with a safe loving environment. Our adoption area is all of Colorado, including Metro Denver (Aurora, Centennial, Lakewood, Arvada, Northglenn, Longmont, Boulder, Castle Rock), also Ft Collins, Colorado Springs, Greeley, Loveland, Bennett, Arapahoe, Brighton, Cheyenne, Sterling, Ft Morgan, Laramie, Canon City, Pueblo, Grand Junction. 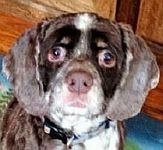 Contact information for Colorado Cocker Spaniel Rescue. We rescue animals picked up by Fort Carson Animal Control, that are lost, orphaned, or abandoned. We then provide these animals with temporary shelter at our kennels in Fountain, CO, so that their owners can reclaim them within five days of being held by Fort Carson Animal Rescue. After the five day holding period we attempt to place these animals with local animal pet adoption agencies and then state-wide agencies. If you have lost your pet, please contact us and provide their microchip number, picture, and/or a detailed description. 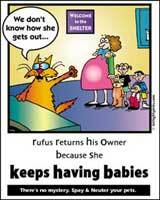 Click here for more information about Fort Carson Animal Rescue.